Once the scourge of sink estates in the UK's largest cities, crack cocaine has now spread all over the UK, according to a senior police officer. The drug is highly addictive, blights lives, and destroys communities - and according to Sean Price, Chief Constable of Cleveland, use is now at its highest ever level. 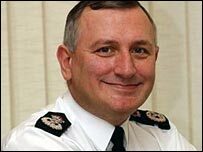 Mr Price, who has nearly 30 years in the force, told an investigation by BBC File On 4: "This is the third time since I have been in the police service that crack cocaine has emerged as the drug of choice." He added: "I think this probably the highest level of usage I have seen in those three times." Its danger is no longer confined to the inner cities, he says. "Speaking to my colleagues it is clear that there are very few parts of the UK that haven't experienced some levels of crack cocaine abuse," said Mr Price. His force is at the forefront of the war on crack in the North East with an intensive effort - nicknamed "a dealer a day" - shutting known crack dens and disrupting gangs. Cleveland and other forces dread the gun and gang violence, often with connections to international networks, that can accompany increased drug dealing and abuse. The police face a tough time controlling this lucrative trade. Like other forces, Cleveland's officers are faced with localities, such as Gresham in Middlesbrough, where long-suffering residents see crack houses prosper as low prices allow almost anyone to smoke "rock" in homemade pipes. Former addict Richard Affleck explained: "What helped crack evolve was cheaper prices - you could get £10 rocks or £5 rocks. You could get one really good pipe or two average pipes." Therapists say the drug creates a psychological dependency where one hit is never enough. 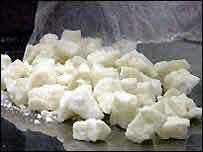 The result is a criminal and chaotic lifestyle for addicts who need to binge on the drug to satisfy their cravings. It creates a ready market for ingenious gangs to exploit. While in the North East police are trying to stop the gangs getting a toehold, in some parts of London they have taken root. Valerie Shawcross, a Labour member of the Greater London Assembly, explained how blatant the trade is even on a busy high street. "When I come through Brixton in the evening, in fact at almost any time of the day, you usually see groups of drugs dealers. "You can see transactions taking place and this is at one of the busiest transport interchanges in London. "You've got commuters and mums and pensioners, thousands of people standing side by side with drug dealers." Back in the North East, the dealers have got into marketing by targeting heroin addicts, including prostitutes, with free samples of crack. According to Jessie Jo Jacobs, who runs a treatment centre in Stockton to help women out of a lifestyle of prostitution and drug addiction, this targeting has been catastrophic for many recovering addicts. Crack cocaine had changed the culture of prostitution, she said, adding: "The ones who are working if they're on a binge they'll have to go out and perform acts seven, eight, nine and 10 times a night. "A lot of women who had come off the streets have actually gone back onto the streets. "As crack's being introduced into their lives they've actually gone back over again which is really sad to see." To hear the full story listen to File On 4, 2000 BST, BBC Radio 4, Tuesday 23 October 2007, repeated Sunday 28 October 1700 GMT.